University of Santo Tomas (UST) Office for Student Admissions announces official release date of USTET. The premier catholic university in the Philippines revealed that list of passers is available online on January 28, 2013. Results now available online by logging-in thru the UST admission results page portal. In a post of tomasinoweb, Official Online Student Publication and Organization of the University of Santo Tomas on January 25, it reports that results are now posted at the University for early checking. Results will also be communicated through University postings starting this January 26, 2013 (Saturday) and through the status letter to be mailed in the applicant’s school address. 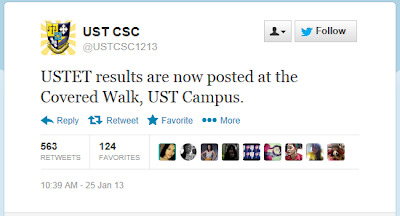 Photo: USTET Results now out! - Please bring USTET Permit / Result Form for identification purposes. aliens;passport/student visa for non-resident aliens. Failure to comply with the above requirements will mean forfeiture of your enrolment slot. USTET was administered in Manila last August 26, 2012, September 30, 2012, November 4, 2012 and December 9, 2012. Although applicant met the required cut-off scores on the program of his/her choice, he/she cannot be accommodated immediately because of quota limitation. Thus, he/she can be considered only if slots are still available after those with higher scores have confirmed. Applicant failed to meet the required cut-off scores of the program of his/her choice or required University of Santo Tomas cut-off scores. Applicant did not meet the required cut-off scores of the program of his/her choice. However, his/her scores met the minimum cut-off set by the University. Thus, he/she may be considered in the other programs where his/her scores qualify, only if slots are still available after those who Passed and On-waiting list have confirmed. General requirements to confirm your slot is also indicated in the announcement. Once available for public viewing, we'll immediately update this page for the complete list of passers. 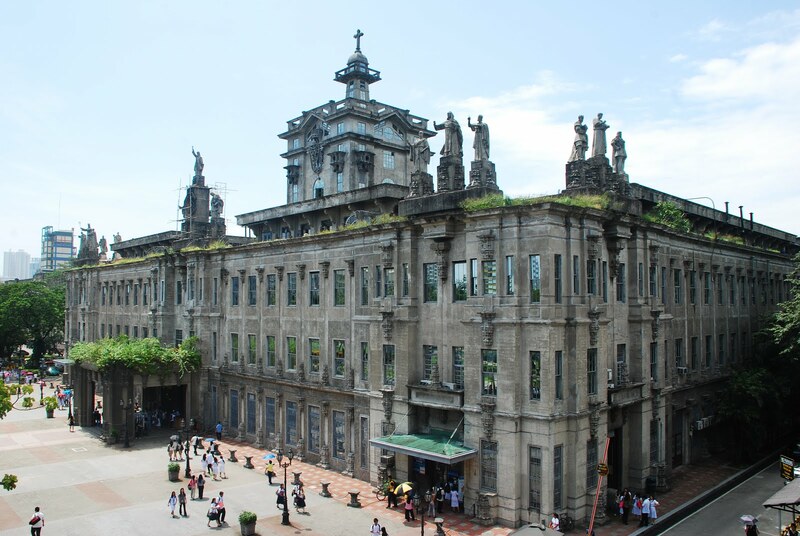 UST is one of the world's largest Catholic universities in terms of enrollment found on one campus and also the largest university in the city of Manila. The university is composed of several autonomous faculties, colleges, schools and institutes, each conferring undergraduate, graduate and postgraduate degrees, and the basic education units. Several degrees have been accredited by the CHED as Centers of Excellence and Centers of Development. Bookmark this page for more updates on USTET. Share now this post on social media for co-takers reference.